Explore the Thames-side towns of Windsor and Eton on a 24-hour hop-on, hop-off bus tour! A great hop-on, hop-off tour package that brings to you the ease of travelling around London, Windsor and Eton. In London, discover the major attractions at your own pace in an Original London Sightseeing hop-on, hop-off bus for a duration of 24 or 48 hours. 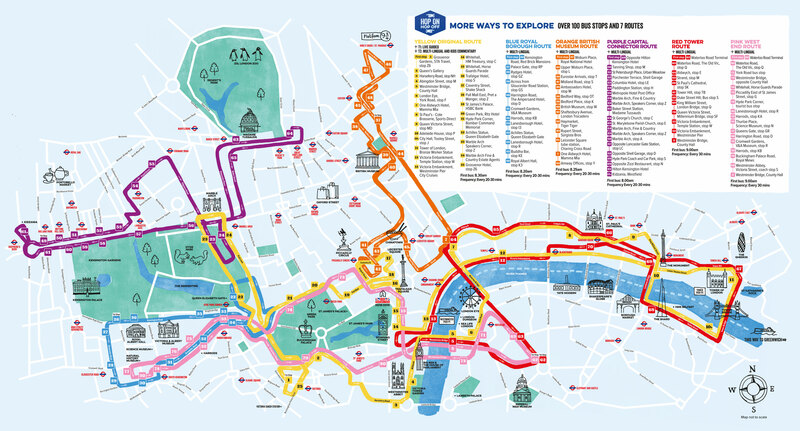 With your hop-on, hop-off ticket, enjoy a FREE Thames Cruise and embark on three fascinating walking tours. During your trip to Windsor and Eton, see attractions like the Changing of the Guard at the Windsor Castle, River Thames, Windsor Bridge, the Guildhall, Eton College and the Windsor Parish Church, at your own convenience. February, March & November: Buses depart between 10:30am and 3:30pm, every hour. April, May & October: Buses depart between 10am and 4pm, every 30 minutes. June to September: Buses depart between 10am and 4:30pm, every 30 minutes. Windsor and Eton Tour: The starting point for the tour is Bus stop 1 - Theatre Royal, Thames Street (stop G), though you can hop-on and begin your tour at any of the stops. Your London Sightseeing hop-on, hop-off ticket also offers some fantastic value additions: FREE Thames River Sightseeing Cruise between Westminster (Big Ben) and Tower of London piers. The all-weather boats with panoramic windows and open-air deck areas, depart between 10am and 4pm, every 30-40 minutes. The Changing of the Guard Walk(10am), leaves daily from The Original London Visitor Centre at Trafalgar Square. Rock ‘n’ Roll Walking Tour(1:00pm), leaves daily from The Original London Visitor Centre at Trafalgar Square. Jack the Ripper Walking Tour(4pm), leaves daily from The Original Tour bus stop at the Tower of London on Tower Hill. Hop on the bus at any of the stops to start the tour. Explore the charming riverside towns of Windsor and Eton, which have been home to the British Royal Family for centuries. Your ticket is valid for 24 hours. Take in the picturesque beauty of the River Thames, see the changing of the Guard at the Windsor Castle and visit the Guildhall and the Windsor Parish Church. There’s much to do at the charming twin towns, separated by the River Thames and joined by Windsor Bridge. Hop on and off at any of the 11 well-placed stops or simply sit back and enjoy the scenic drive. Explore Windsor and Eton from open-top buses and enjoy informative audio commentary in 10 languages. With buses arriving at a frequency of 30 minutes, wait less and explore more! Bask in the old world charm of the two towns, experience the pomp and ceremony of the changing of the guards, hear the Evensong at St George's Chapel, count swans with the HM Swans Marker and visit the Queen's residence. The confirmation voucher includes the local activity operator’s contact details and local telephone numbers at the destination. They will happily answer any logistical questions you may have. All tickets are valid for 6 months from the date of booking.